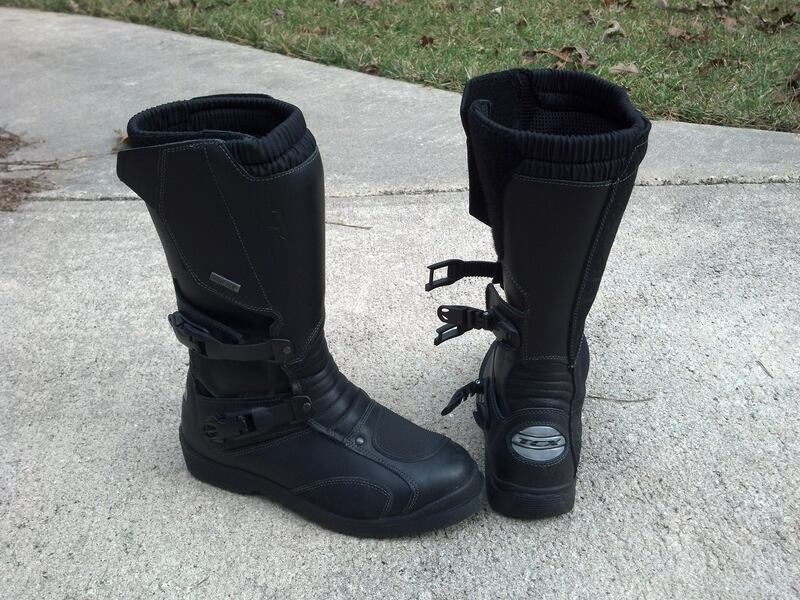 After a number of years of wearing motorcycle boots that were made specifically for women, which fit great, but lacked in the protective elements that are easily found in men’s boots, I decided to make the decision based on functionality first this time. Back to the boots. When you travel by motorcycle, you have two options if you can’t be bothered by wet feet: truly waterproof boots or pulling on those rubber boot covers on the side of the road. After too many promises of “waterproof” boots over the years, the first item on my requirement list was Gore Tex. In addition, I was looking for serious shin and ankle protection. There were a few options in women’s boots with Gore Tex, however, finding a pair with Gore Tex AND the protection I wanted proved impossible. For Women’s boots, the ones with serious protection were racing style boots that don’t really suit my riding style, nor did they have Gore Tex. Hmmm, so off I went to look at men’s boots. I wasn’t necessarily looking for an adventure-style boot, although I do enjoy my adventure-touring BMW GS, and its ability to go from long distance highway miles to gravel forest roads. It was the features that sold me on the TCX Infiniti GTX boot. Full leather uppers and the Gore Tex membrane make the boot both waterproof and breathable. Protection includes polyurethane shin and ankle reinforcement, both inside and outside of the ankle, suede inner heat guards, and shift pads on both boots. Reflective patches on the heels add visibility as well. I liked the adventure styling, which is more subtle than some over the top motocross styles. 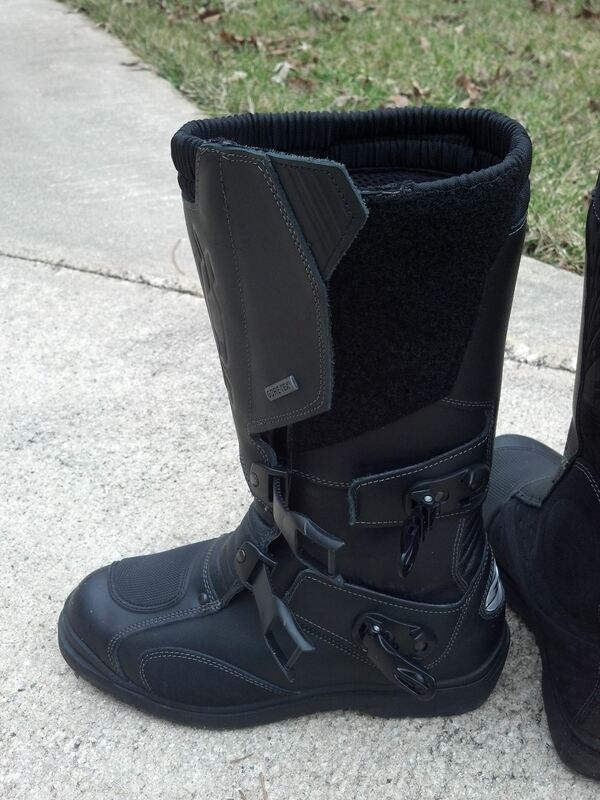 The boots are also slim enough that my riding pants fit over the boot. 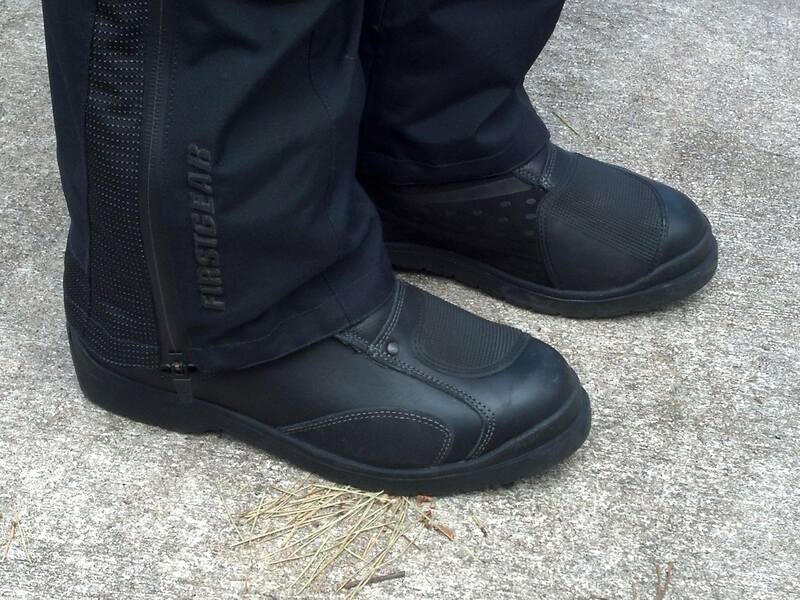 This is key, when wearing waterproof pants, to keeping the rain out of the top of the boot! The boots are definitely comfortable enough to walk around a sightseeing stop or historic downtown, but serious hiking will require a change of footwear. I did read a few reviews that lamented fiddly buckles, but that has not been my experience at all. I found that the adjustable buckles snug the boot up around the foot and ankle, while the hook and loop provides a secure feel around the calf. The one thing I have noticed is that since the Infinity GTX snugs up tight on my ankle, it provides less play for my foot when reaching for the ground. I am 5’7”, and I ride a standard height GS, with a GS Adventure seat, so I am challenged to tip toe both feet at the same time. I believe my previous boots just gave more leeway to point my toes, but I am adjusting quite well to the reach, in exchange for additional support and protection for my feet and ankles. And you don’t need to reach the ground when you’re rolling anyway. I have about 500 miles on the boots so far, given that I received them as a Christmas gift from my dear husband, and it is still winter, even here in the South. I have not tested the waterproof-ness, but I believe that the Gore Tex will deliver as promised. I expect that they will also continue to break in and become even more comfortable in time. And if your significant other is a rider, never underestimate the value of a functional gift, even if it’s not a surprise. 😉 I highly recommend the TCX Infinity GTX boots, for both men and women. PS: After many riding months and a recent ~2000 mile trip, I can wholeheartedly recommend these boots and attest that they are completely waterproof as well! I wore them 10 to 12 hours a day for 8 days in all types of weather, and they delivered exceptional function and comfort. I recently bought some TCX shoes in waterproof(?) leather just so I at least had some coverage over the ankle while I put some mileage on the new toy. Nice quality stuff I thought. Good on ya for taking a break, no pressure to do anything in a rush, I reckon. Now that I’ve finished my 5000 word intro I can finally get around to writing what I wanted to about my ride…sheesh! Yeah, but it was a great intro! Thanks Guap. Part 4 next week at this rate. Yes, RD, this my second pair of TCX boots, but the company was previously known as Oxtar, and I think they got bought out. Quality products, for sure. So no problems with your feet sweating, or the boots holding odors? I expect that there will be some level of breathability, with the Gore Tex, though. It gets pretty hot here in the summer too, so some level of hot feet is expected when you are wearing protective boots. It’s worth it to not break an ankle or foot, though! I’m shocked that womens’ gear is catching up to the safety standard of mens. Seriously. Good to know that your boots are up there.